Generally speaking, parents will want to avoid giving their kids high-calorie foods. Just one milkshake, for example, can represent for half the recommended daily calories for an 11-year-old boy or girl. Eating foods like this, while satisfying, can significantly increase a child's risk of obesity. However, there are times when high-calorie foods are needed to help a child gain weight or avoid weight loss. While doing so can be challenging from a nutritional standpoint, there are strategies that can help achieve these aims without undermining your child's good health. As much as we focus on the risks of obesity in children today, there are kids who have the opposite problem and struggle to gain weight. In some cases, the child may be a picky eater or growing at a rate to where the intake of calories doesn't match the increases in growth. While situations like these can be worrisome, they tend to transient and resolve on their own or with a little encouragement from parents. However, there are times when the causes are not so straightforward, and the interventions need to be specific, immediate, and ongoing. Type 1 diabetes can lead to severe weight loss if uncontrolled. Congenital hypothyroidism is associated with poor growth. ADHD medications are known to cause appetite suppression. Cystic fibrosis can make it difficult to gain or sustain weight. Celiac disease can cause low weight and short stature in kids. Eating disorders, like anorexia nervosa and bulimia nervosa, are now being seen in girls as young as 10 or 11. Children who eat low-calorie diets, often because their parents do, may lose weight despite eating generous portions. Depending on the underlying cause, you may need a specialist physician as well as a registered dietician to help design a diet appropriate to the condition. There is rarely a one-size-fits-all solution. With that being said, any weight-gain diet would be composed of high-calorie, nutrient-dense foods that are low in saturated and trans fats and high in fiber and healthy fats. When designing a weight-gain plan, it is important to meet the nutritional goals outlined in the 2015-2010 Dietary Guidelines for Americans issued by the Office of Disease Prevention and Health Promotion (ODPHP). Protein sources should be comprised of lean meat, poultry, fish, seafood, eggs, beans, soy products, nuts, and seeds. Fruits and vegetables should be part of every meal. Encourage a variety of vegetables, including starchy ones that encourage weight gain. Dried fruits are also high in calories. Whole grains, such as whole-wheat bread, oatmeal, and brown rice, can help improve digestion and promote heart health. Refined grains, such as white bread, pasta, and rice, are discouraged in most diets but can be extremely beneficial in underweight children. Unsaturated and polyunsaturated fats should replace monosaturated fats and partially hydrogenated oils. Use heart-healthy vegetable and nut oils instead, including olive oil and canola oil. Dairy products like milk, yogurt, and cheese should be encouraged. However, avoid non-fat dairy products if your child is thin, and don't be afraid to use full-fat dairy, including whole milk and ice cream. As a rule, avoid anything labeled "diet." If in doubt about any food on a weight-gain plan, speak with your pediatrician. This is especially true if your child has diabetes or digestive problems or is on chronic medications. If your child needs to gain weight, work strategically. Starting by figuring out how much your child is supposed to weight (based on a BMI percentile) and whether or not he or she falls within the underweight category (less than the 5th percentile). If your child is underweight, you can then determine how many pounds need to be gained and over what period of time. Next, figure out how much food your child is eating on any given day. You can do this by keeping a journal and recording not only what food is being eaten but how much. You can then use an online calorie calculator to determine the exact number. If your child's intake is significantly under the recommended value, start by increasing the daily intake to meet the recommended goals. If, on the other hand, the OPDHP goals are being met, increase the calorie intake by roughly 20 percent to gradually gain weight up to 35 percent to gain weight faster. Increasing the daily calories is not as easy as it seems. In the end, your child needs to be able to gain weight without feeling force-fed. Doing so only create anxieties that hurt rather than help the cause. Instead of piling food on a plate, find high-calorie "add-ons" to supplement a dish. It may be as simple as pouring maple syrup over pancakes or making sauces or gravies for the evening meal. Doing so can easily add 50 to 100 calories without anyone even noticing. The same applies to snacks. For an afternoon snack, add some trail mix (43 calories per tablespoon) to a container of yogurt or some peanut butter (90 calories per tablespoon) to a couple of crackers. If serving dessert, make à la mode (137 calories per scoop). By adding 100 calories at a time, you can achieve your weight-gain goals without placing undue stress on yourself or your child. When stocking your high-calorie larder, avoid storebought cookies, chips, sugary drinks, and junk food. 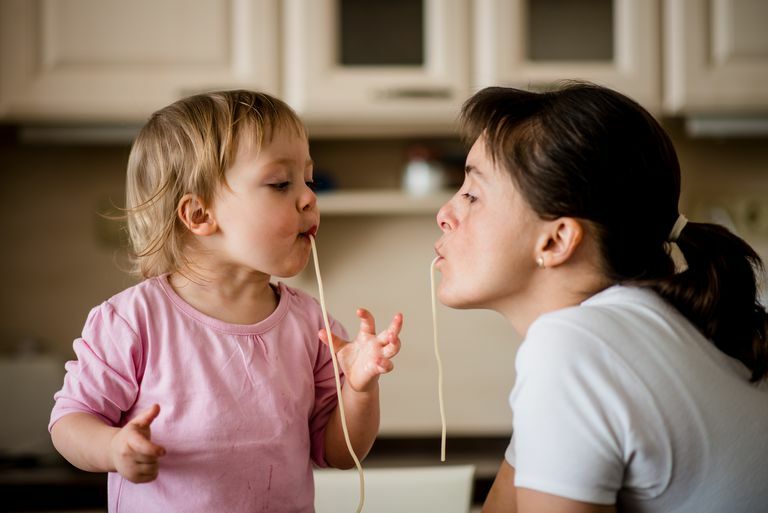 As much as you want your child to gain weight, you also need to teach good eating habits that can last a lifetime. This includes knowing when it's time to snack and when it's time not to. Concentrate instead of finding foods that are easy to prepare but are no less healthy than the foods you would make for a normal-weight child (albeit with fewer calories). U.S. Department of Agriculture. USDA National Nutrient Database for Standard Reference. Washington, D.C. updated February 4, 2018.